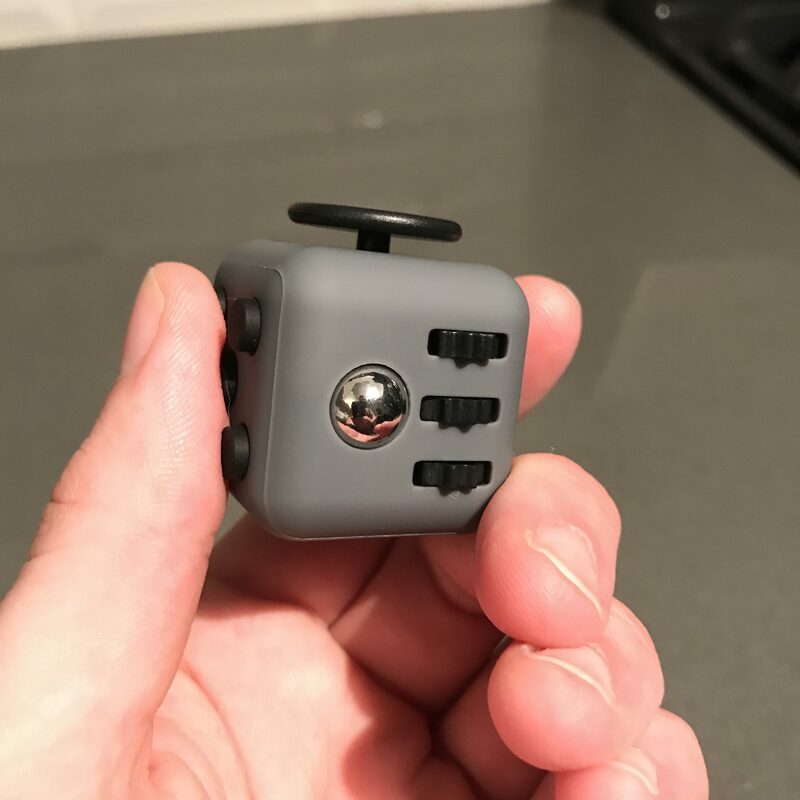 Ah yes, the fidget cube : the thinking man’s fidget spinner. Marketed towards desk-bound professionals and creative types rather than app-addled preteens , this desk toy promises stress relief and aided focus as you click, spin and flip. 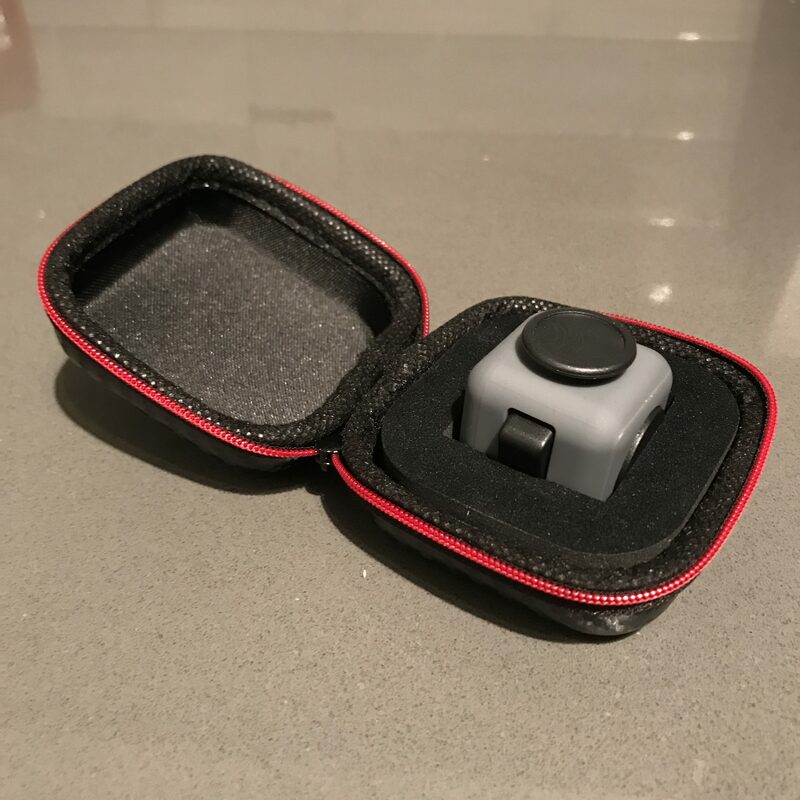 Before I go any further, the product i’m reviewing appears to be a replica of the original device sold by Antsy Labs. Credit where credit is due, they came up with it first (it was originally a Kickstarter) and are the genuine article. The KCHKUI Fidget Cube is priced lower but at first glance appears identical. The packaging is this zippered, faux carbon fiber carrying case with the cube’s functions printed on top. Open it up and there you have it. I ordered mine in muted grey and black, but it comes in a variety of color combinations. First impressions were a bit underwhelming. The first widget I went for was the steel roller ball, which felt stiff and grainy but loosened after a few minutes of use. Pressing on the roller ball yielded the most satisfying click of all the clicky options, a firm pop reminiscent of the button on a pickle jar lid. Next to it are plastic gears which did not ratchet like I expected but spun freely instead. On the opposite face is a spinning wheel with a nub to aid in rotation, I found this awkward to spin as it has no “follow” of its own., you must continuously apply motion. 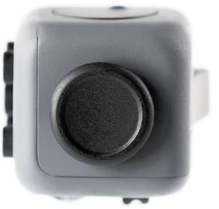 At the top of the cube you find a joystick, which doesn’t smoothly twist on its axis but instead is meant to be rotated at its pivot point like, well, a joystick. This is spring loaded and snaps back to its resting position when released, yielding a buzzy clack. Directly beneath the joystick is a “worry stone” feature : a concave indentation which is pleasant to rub your thumb around in for a while but soon becomes tiresome like the wheel. For clicking options, you have a face with 5 buttons arranged in a die-like pattern. Two buttons are silent and offer slightly different resistance levels, and the remaining three click at different pitches. Across from that is the final clicker, a lever switch with substantial action and loud report. 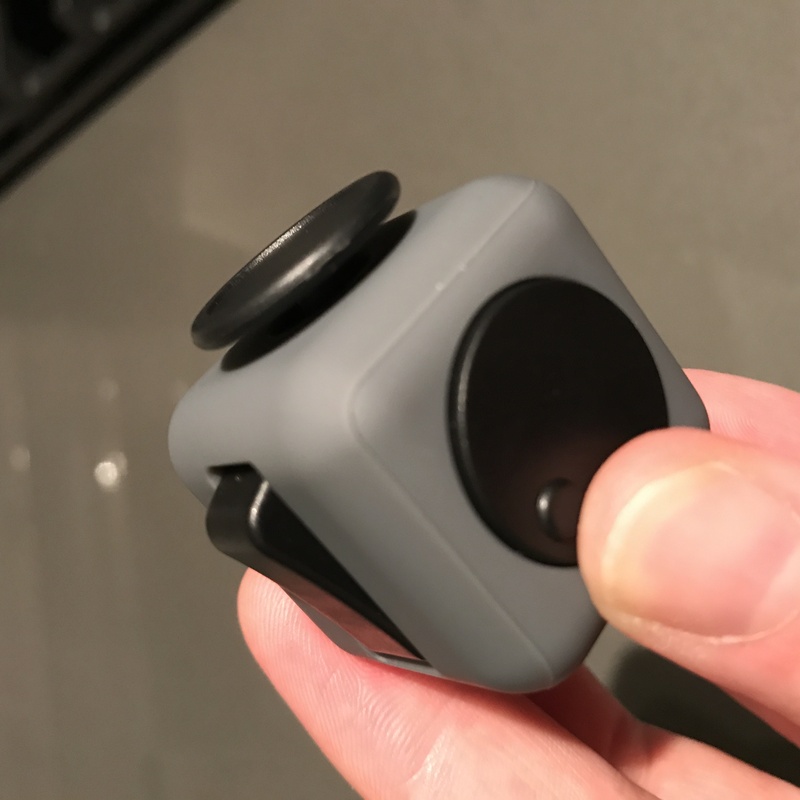 I’ve played with this cube for the past 24 hours and I will say it’s pretty addictive. I find myself drawn to the steel ball the most, rolling it with my thumb while I check emails or crunch on a problem. I stayed away from the clicky options while at work, as I already have a Das Keyboard that drives my coworkers crazy. My biggest criticism is there is no function that lets you spin with momentum, everything needs constant “input” to rotate. I was hoping the joystick would serve that role but it barely spins at all and probably isn’t even meant to. The gears would have been nicer if at least one of them clicked in steps rather than spinning loosely. As far as comparing it with the Antsy Labs version, I haven’t used one yet so I have no frame of reference. Based on photos from their original Kickstarter, the biggest difference looks like the joystick. The original seems to have a thicker disc with a larger diameter and a more pronounced rim. The seams are also arranged differently. 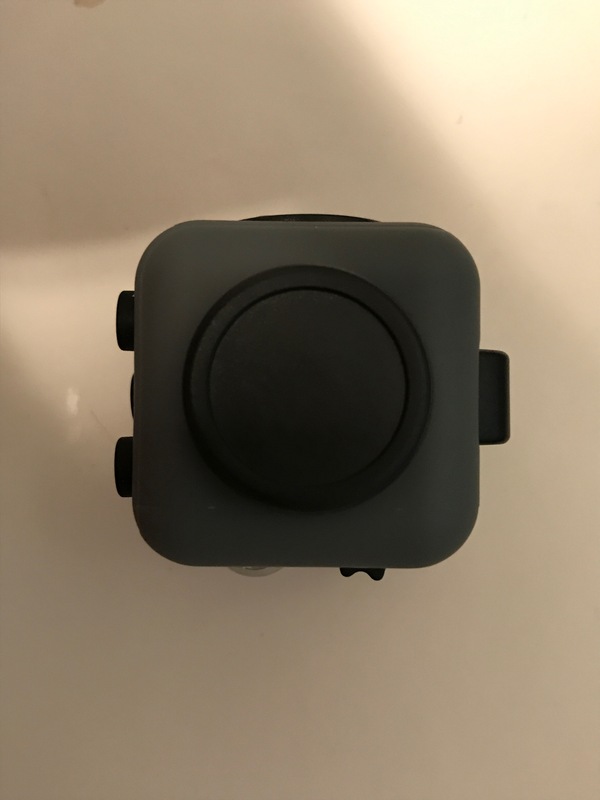 I plan to pick up the original cube to get a proper comparison going. 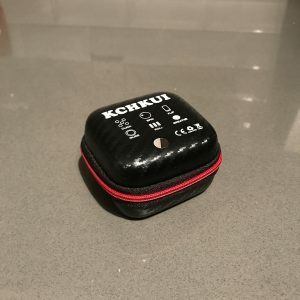 For now, I would recommend picking up the KCHKUI version from Amazon for $9.99, just to see what the big deal is. Think i’m just a fidget noob and don’t know what i’m talking about? Then let me have it in the comments! And yes, this isn’t a hi-fi audio device under any normal definition, but it clicks, and a click is a sound, so yeah.